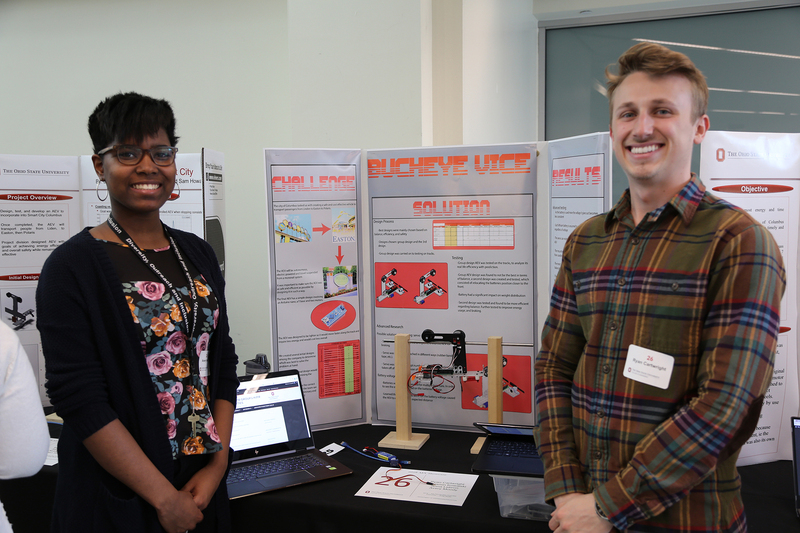 The annual Advanced Energy Vehicle (AEV) Showcase & Competition was held in the Physics Research Building on April 23.More than 100 first-year engineering students from Ohio State’s Columbus and regional campuses took part in the annual Advanced Energy Vehicle (AEV) Showcase & Competition on April 23, 2018. As part of a semester-long project, teams were tasked with designing a vehicle that could stop at a gate, pick up a load and return to the starting point. The design problem they addressed was modeled after a real-world transportation issue currently being addressed by Smart Columbus, a $140 million program to transform central Ohio into the nation’s premier transportation innovation region. Top teams from each section of the Fundamentals of Engineering course were selected to compete for best website, best poster presentation and best performance in a track competition. 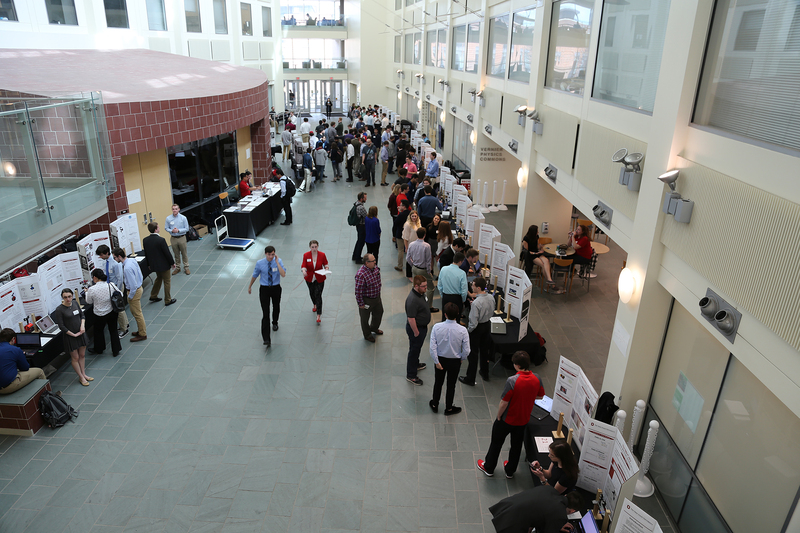 The poster competition consisted of three separate presentations by students of their vehicles and data to support their designs, which were judged by faculty, graduate teaching assistants and Ohio State alumni. Additionally, one seventh-grade gifted student from Pickerington acted as a junior judge as part of a pilot STEM outreach program. 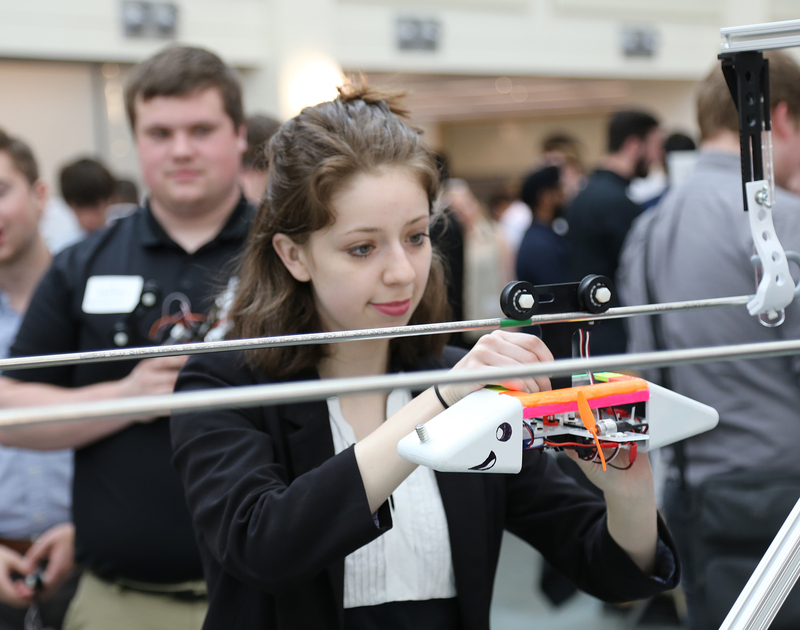 “The progress the students made throughout the semester and their ability to communicate it was impressive,” said showcase coordinator Meg West, a graduate teaching associate in the Department of Engineering Education. Avery Moody and Ryan Cartwright prepare to present their team's poster during the AEV Showcase.The track competition was composed of three rounds with the first two testing vehicles’ ability to travel precise distances and for precise amounts of time under various loads. The final round tested the vehicles’ ability to use as little energy as little as possible. Students displayed a wide variety of AEV designs in the track competition. Some relied on standard parts provided in the course, while others used 3-D printed and laser-cut parts that they designed in SolidWorks. “It is always exciting to see the creative and innovative designs that our students come up with for their vehicles,” course coordinator Patrick Herak, a senior lecturer of engineering education, said. The top six project websites from all sections were selected to participate in the website competition. A panel of faculty and staff judges determined the winner based on the clarity of students’ documentation and the quality of their presentation. The afternoon ended with Ohio State graduate McKinzie Harper updating students, staff and faculty on the progress of the Smart Columbus project and an awards ceremony recognizing the top three teams of each competition. The 2018 Advanced Energy Vehicle (AEV) Showcase & Competition was sponsored by Boeing and hosted by the Department of Engineering Education. View more photos of the competition online.